Soon in 1987, l-to-r: Con O'Donovan, Tony O'Sullivan (front), Martin Vallely (back), Giordai O'Laoghaire. Short-lived Cork band whose career spanned just 8 months in the mid-80s. Their sound incorporated a welter of influences from jazz to avant rock and reputedly owed as much to King Crimson or Bowie as the New Wave rock of the day. They were certainly perceived as one of the more adventurous and musical outfits of the period. 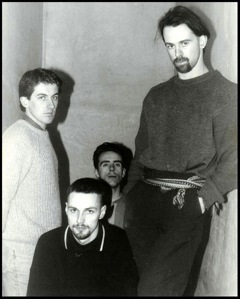 They began as a trio of Tony O'Sullivan (vocals), guitarist Giordai O'Laoghaire (ex Nun Attax, Microdisney) and Martin Vallely (ex Boat People) on bass, before adding drummer Con O'Donovan (ex Belson / Belsonic Sound), who was later replaced by Arty Lorrigan. The first demo was recorded at Sulan Studios in Ballyvourney. This was followed by a Battle Of The Bands appearance at Sir Henrys in Cork which left the audience more than a little bemused. A second demo was recorded for RTE's Anything Goes ("In A Nutshell") and the band appeared on Megamix performing "The Holy Holy Show". They also recorded a Fanning session for RTE Radio with new drummer Arty Lorrigan. This was their last recording. The simpler, more melodic new material they were writing at the time of the split was never recorded. Martin Vallely was later in No Sangoma. Con O'Donovan currently plays with The Taxmen (see links below). If anyone has copies of any of the recordings (seven studio tracks in all) or TV either appearance, please get in touch. 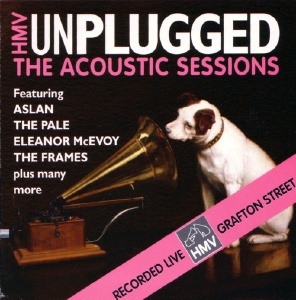 Recorded at Sulan Studio Ballyvourney by Tadhg Kelleher and Gerry McBride.